Stripe is one of the world’s leading online payment service providers helping individuals and businesses to accept payments. Stripe merchants can integrate with Zoho Books to track their sales and consolidated payments they receive on a daily basis. Why Integrate Stripe with Zoho Books? Track payments you receive on sales through your Stripe account. All these transactions are a virtual projection in your Zoho Books account, paving way for an easy reconciliation process. Track the overall sales that happened through Stripe account. Track the sales that happened in Zoho Books through Stripe. Track the amount Stripe owes you. Track the fees Stripe charges you. Easy to handle reconciliation for your bank account in Zoho Books. Sync the information from your Stripe account to Zoho Books to keep track of your sales and the money Stripe owes you. You can select the appropriate accounts from your Chart of Accounts or create an account in the setup page to track sales and Stripe fees. To set up Stripe integration, navigate to Settings > Integrations > Online Payments and click on Connect with Stripe placed in the same tab as Stripe. 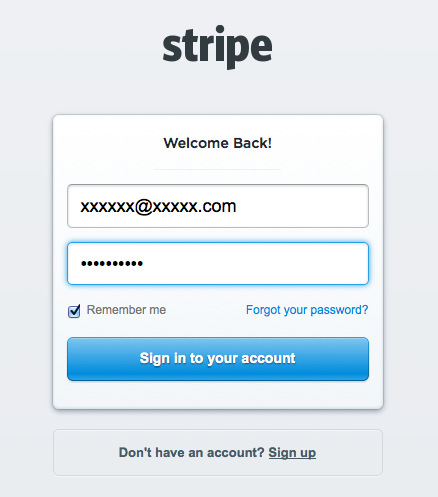 On clicking on Connect with Stripe, you will be navigated to the Stripe login page. You will be asked to enter your Stripe credentials to connect with Zoho Books. Login to your Stripe account. 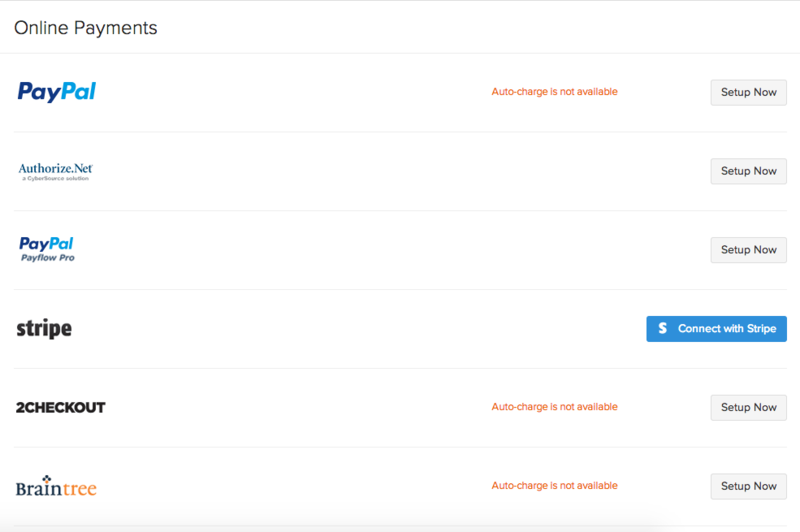 From the Switch account drop down select the account you would like to monitor in Zoho Books and select Connect my Stripe account. On connecting Stripe with Zoho Books, the Stripe Account Name will be shown and a green coloured success message will signify that the account is successfully connected. Until now, your payment gateway has been set up. To monitor all your sales, Stripe fees and the amount, click the Configure to track Stripe transactions button. 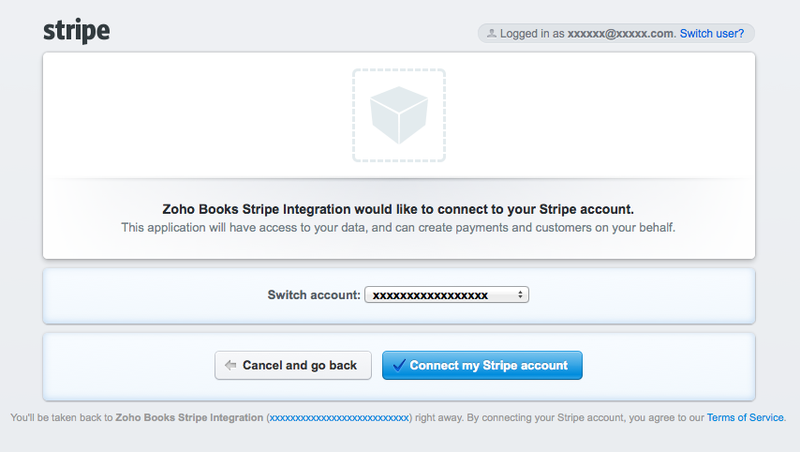 On clicking the Configure to track Stripe transactions button, you will be able to view the configuration section. Provide a name for the account which will track the money held by Stripe in the Banking module. By default, the label is Stripe Clearing. This account will be of type Payment Clearing Account. Track the bank account where Stripe transfers the money. Either select from previously added bank accounts or type to add a new one. Map accounts to track Stripe fees and the sales from Stripe transactions. This account tracks the fees charged by Stripe for the transactions processed through their payment gateway. By default, the label is Stripe Fees. This account will be of type Expense. This account tracks the total sales that happened through Stripe transactions on your Stripe account. By default, the sales account is selected. This account will be of type Income. Zoho Books also supports Stripe accounts holding bank accounts with multiple currencies. The Stripe clearing account in the Banking module will give you insights on the transactions that happened on a daily basis. You can easily have a clear picture of the consolidated sales that happened, the fees Stripe has charged for the transactions, refunds if any and the amount transferred to your bank account by Stripe. If there are any pending amount that Stripe owes you, it will be shown as Amount in Zoho Books on the main tab. 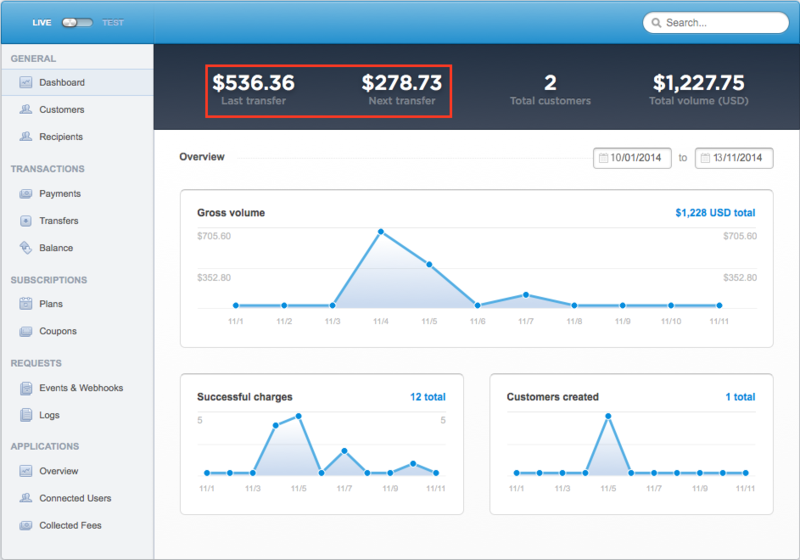 Sales without Invoices Total amount of previous day’s consolidated sales processed through your Stripe account. Sales Return Amount refunded through your Stripe account. Stripe Fees The fees Stripe charges for every transaction processed through their service. Transfer Fund The amount Stripe deposits in your bank account. This section will help you in understanding how to monitor the sales information from Stripe with Stripe clearing account in Zoho Books, so you can regularly check with the amount Stripe owes you and the amount Stripe has deposited in your bank. Select the Dashboard and you will be able to get the Last Transfer, Next Transfer and the Total Volume of sales, by selecting the date range. You can also check the payments accepted, refunds made and their breakups from the Payments tab. Transfers made to your bank account and the money Stripe owes you, can be checked from the Transfers and Balance tab. 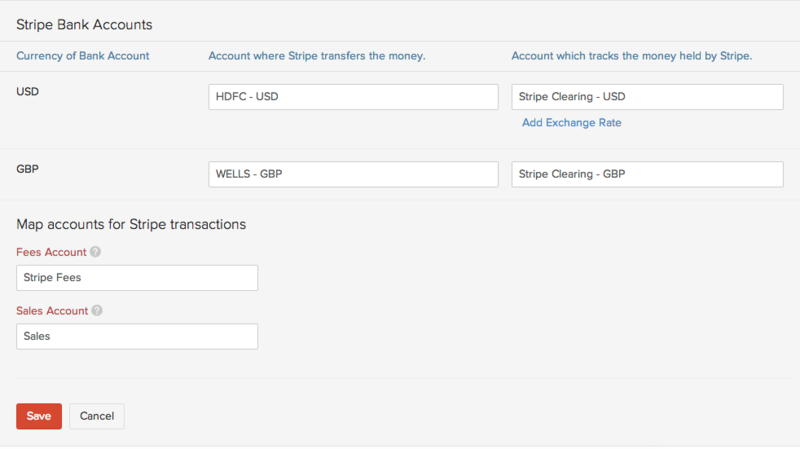 Navigate to the banking module and select the Stripe Clearing account which tracks the transactions processed through Stripe. For every amount that Stripe deposits in your bank account, a transaction type Transfer Fund will be created in your clearing account. To cross verify the amount deposited in your bank account by Stripe, select your bank account in which you have configured to track the Stripe deposits. You will be able to find a transaction with type Transfer Fund and the amount would be recorded as Deposits. The online transaction fees will depend upon the charges specified by Stripe. For individual reports, navigate to the Accountant tab and select Account Transactions. Select the specific date range you wish to have reports for and select the Sales, Stripe Fees, Stripe Clearing or the bank account in which Stripe deposits from the Account Name tab and Run Report. For an overall view of the income, other assets and expense, the General Ledger, Journal Report and Trial Balance reports will help you. To monitor the activities of this integration from connecting to Stripe, enabling integration, updating settings till the transfer of funds, navigate to Activity Logs reports under the Activity tab. Select Stripe from the Activity Related To drop down, to view all the Stripe related logs exclusively.